Are you frustrated that it takes your prospect months to make a buying decision? Does your business have a naturally long sales cycle? Discover how Kennedy Blue increased sales 50% by overcoming sales objections with popups. And they did it despite a sales cycle that could be months, or even years, long! Kennedy Blue was founded to change the wedding industry. They offer high-quality designer dresses, a better shopping experience, and affordable prices, delivered directly to the bride’s home to try on and buy. The website is built on the popular eCommerce platform Shopify. Lots of soon-to-be brides get their wedding planning advice from Kennedy Blue’s popular blog. Unfortunately, readers are often very early in the process of planning a wedding. They will eventually purchase bridesmaids dresses, but may take months before they’re ready to make a decision. Before using OptinMonster, Kennedy Blue hardly collected any emails at all. They knew that had to step up their email marketing if they were going to stick with potential customers for months as they prepared to make a purchase. eCommerce buyers have objections to making a purchase the same way customers at a brick and mortar store do. The most common are price, product fit and competition. Let’s take a look how Kennedy Blue is overcoming sales objections like these using OptinMonster. Overcoming sales objections almost always starts at price. Kennedy Blue uses a floating bar optin displaying notification of a sitewide flash sale to remind shoppers of the savings they’ll receive when they purchase. The optin uses our Countdown Timer floating bar, which draws on the customer’s fear of missing out to drive the sale. If they put off purchasing too long, they’ll pay more. Kennedy Blue’s unique business model is new to the wedding industry and presents its own unique challenges. Traditionally, brides make appointments to visit a gown store in person, bringing their bridesmaids with them to try on several different dresses. They spend hours finding just the right style, color and fit. With Kennedy Blue, they wedding party has an entirely different experience. They are offered the option to order free color swatches so they can first decide on the colors they’d like. Then, they can order dresses delivered to try on in the comfort of their own home. Ordering a color swatch is often the first step in their sales funnel, so Kennedy Blue focuses on that offer using a sitewide slide in scroll box. This optin converts 2.56% of shoppers. Kennedy Blue shows their dedication to providing better customer service than its competitors by asking shoppers to provide feedback about their experience when they leave the store. They do this using a lightbox popup triggered by our exit-intent technology. The optin uses our Yes/No feature to give the reader the choice to either take the survey or simply close the optin. Our Yes/No feature turns any optin into a two-step optin by displaying buttons which can display an optin form, redirect to another URL, or simply close the optin. This optin converts an average of 1% of shoppers. But, not all pages are equally important when it comes to conversions. The shopping cart page is particularly important because it’s only reached after a shopper has added a product to the cart. In other words, they’re ready to buy. On the shopping cart page, this optin converts nearly 7% of abandoning shoppers. These are potential customers who are leaving their products behind in the cart without buying. The survey provides Kennedy Blue valuable feedback from customers who were very close to making a purchase, but changed their mind at the last minute. The survey tells Kennedy Blue what they might have done better to save the sale. Before using OptinMonster, Kennedy Blue hardly had an email list. Now, they collect thousands of emails every month. Within a month of using OptinMonster, sales increased 50%! Kennedy Blue tackled their shopper’s common objections head on using a variety of optin types and triggers and increased sales dramatically as a result. 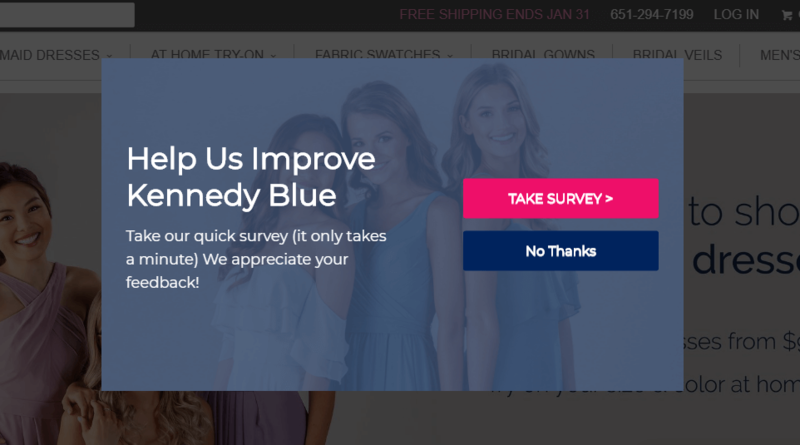 Kennedy Blue gained the valuable feedback of 7% of abandoning shoppers using a survey in an exit-intent lightbox. Kennedy Blue increased sales 50% after implementing OptinMonster. Kennedy Blue added 2.56% of readers to the front end of their funnel using a slide-in optin. If you have a long sales cycle, capturing your prospect’s email address is hugely important. Once you have their email address, you can nurture them closer to a sale with drip campaigns and pay-per-click campaigns. Be sure to consider the objections shoppers have to purchasing from your store and use your optins to help overcome those objections. OptinMonster is easy to use and integrates easily with Infusionsoft. It is important for us to capture an email, tag them to a campaign and send customized emails. OptinMonster made this very easy to do. OptinMonster is a must for anyone serious about eCommerce and digital marketing. Within a month of setting up OptinMonster and marketing automation, we saw a 50% increase in sales.